Fwiw I have wiped two cams so far. Modified the oil spray pattern, lowered oil pickup, added windage tray. So far no issues with ~6K miles on this setup. Time will tell. 1. Cam inspection should be part of pre purchase inspection of any 2005 or 2006. 2. Running oil with ZDDP is a great idea, but doesn't necessarily prevent cam damage. 3. Cam wear is a pain, but as long as you pop the cam cover every so often, catastrophic failure may be preventable. 4. Set lifter clearances on the looser side of the range. 5. 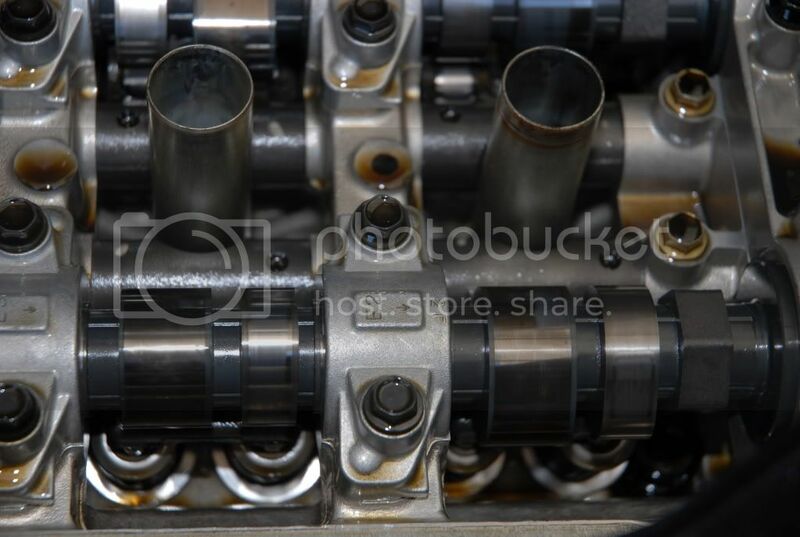 2nd cam wear seems to be associated with getting into the 2nd cam before the oil is up to temperature. 6. In cold weather, it may not be easy to get the oil hot enough to make 2nd cam use a good idea. Well I thought it was running great but it red lights at 5500rpm and flags a code P0012. <----yes retarded cam timing. So a yanked the clam, pulled the timing cover and replaced the crank sprocket and timing chain. Crank sprocket was missing 2 teeth and the remaining teeth were fairly sharp. After putting it all back together I was pretty certain that it would be good. But no, I got the P0012 again. So I removed the cam, and replaced the sprocket advance kachuga. I'm gonna go replace the cam advance solenoid while I wait for a response. It has to be me because I didn't have a DTC before. What else can I say but WTF! Excellent summary. That is my takeaway as well. 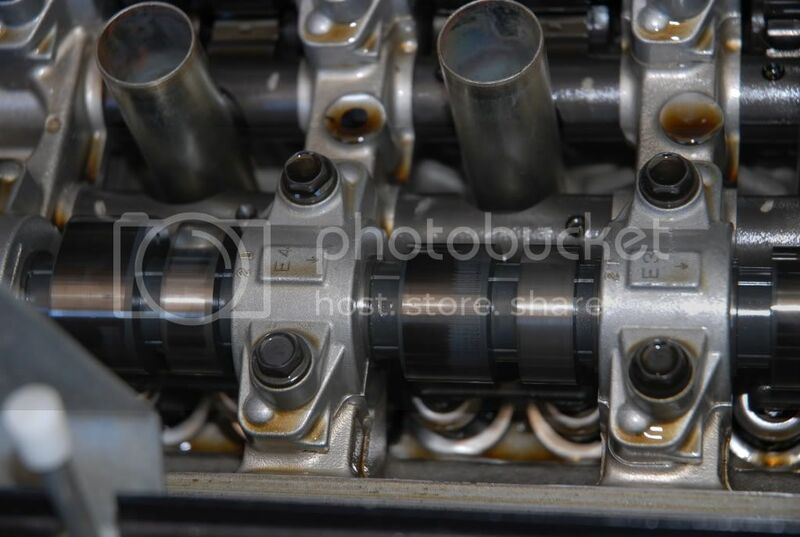 I'm almost looking forward to wiping my new intake cam so I have an excuse to get a set of Pipers. Pretty dumb, huh? Crank sprocket was missing 2 teeth and the remaining teeth were fairly sharp. Dumb question, you replaced the crank sprocket right? Installed new cam and rockers last night. Measured buckets with the dial indicator. I'll go easy till new buckets come in. I'm getting confused by your posts. Are you saying that you are running the car with improper lash???? I'm not mechanical whiz, but that seems really...uh... BAD. The valve lash is < err-hirm > in "spec" but we want it looser. My book says 0.003"-0.007" maybe 4 - 7 whatever I want 0.010"-0.012" intake. Basically moving it up to exhaust specs. Yes i did replace the sprocket and chain. In 10 years I have only seen two damaged crank sprockets ever on these engines. One was from a customer prying it off then reusing it, not noticing that a tooth had been cracked in the process. The other was a customer who was revving far beyond the stock rev limiter on stock valvetrain. Not sure if that was the issue or the fact that he found his tensioner appeared to have excessive play (possible failed ratcheting mechanism) but it was obvious looking at the guides that the chain had been bouncing around more than normal. Definitely check out your tensioner. 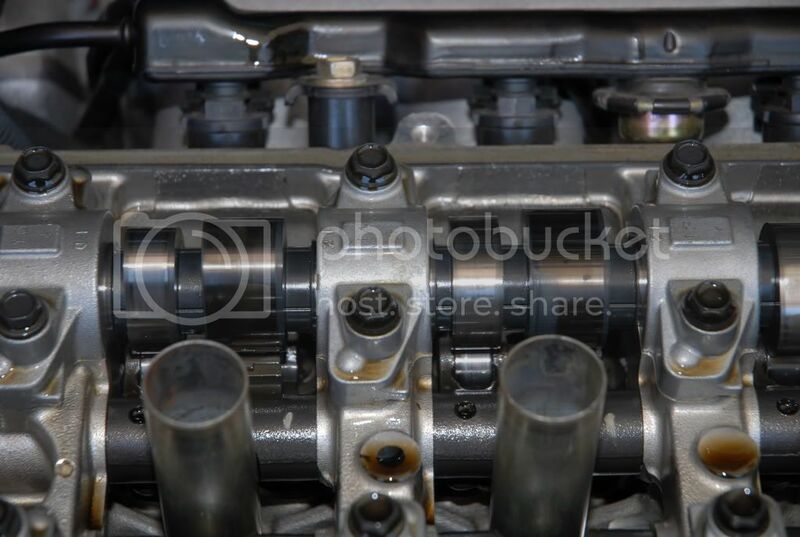 Any evidence of the chain hitting the outer guard on the oil pump housing? I bought the car used almost 2 years ago. 8750 rpm seems to be the highest the limiter will let it go. There was one time that i caught 2nd gear while trying to find 4th, that happened right after I bought it-----long time ago. Tensioner seems to be fine, ratchet was not compromised. Car is running magnificently now soooooooo. If it fails again I suppose I'll go deeper into why. I'm past that stage of life where I have to know everything about everything. I have another motor to build and put in, till then this one will do as is. I have a question for ya though now that I think of it. Has anyone yet wiped a piper cam? Is it only factory cams that take a crap like this? A lot of people have done a lot of speculating about possible causes. I'm thinking that the cams are just pieces of crap. Not likely oil type, or lash, or oil temp. It just makes more sense to me that the part that failed was in fact the cause ( in this particular case ). DWebb . . . You have PM sir . . . So it's been about 750 Miles since I put the new cam in and I hadn't had any issues/sounds, but I figured why not check to see how the BRAND NEW CAM/ROCKERS are holding up . . . Well, see for yourself . . . So, unless I am having a bad dream or am seeing something that isn't really there, this clearly looks like this cam is well on it's way to being destroyed . . . So, what should I do now? Put in another new cam and set of rockers? I didn't adjust valve lash or any of that last time, should I do that to this set of rockers and cam or should I adjust the VL and replace the cam/rockers again. I don't know how to adjust the valve lash correctly, is there anywhere that sells the buckets pre-filed down to .010ish? PS: I measured my valve lash during the installation and it is .005 across the board . . . I did send you a PM earlier. I was talking to an old engine builder friend who had this problem with old flat tappet chevys. Our old flat tappet Fords always seemed to make more power when set up loose. So it was natural to want valve lash high. Consequently, I'd never had a cam do this. But my buddy does concur that 0.005" is a tad too tight for a flat tappet cam and He recommends setting your valve lash at around 0.008" While Turbo Phil if I'm not mistaken is happier around 0.010". I say if you get it between 8 and 9 you should be good. remember your lash is currently 0.005 straight across. That said remove one bucket and measure the thickness of its cap. Record that measurement and reinstall. There is a table in the service manual that lists the part numbers and thicknesses of replacement buckets. If you want 0.008" lash you will subtract 0.003" from the measurement of your current bucket to get the thickness of the new buckets you will want to order, or if you want 0.010" subtract 0.005". Lobes look like normal wear to me. I concur. Unless you can feel the wear with your fingernail or similar, I'd say it's fine. You are running full synthetic for oil, yes? 2) If you're in a pinch and cannot get the right bucket, the buckets are hardened all the way through... You can actually mill, file, sand, etc the bucket within reason- just do your best to have a square product when finished. (I hate typing tricks like this as I'll probably get chastised by someone that doesn't understand the system, but oh well . Take the suggestion at your own risk. Your milage my vary ). I've done this on my own car and works just fine. When you're setting the head up on the bench, most builders simply tip the valves to work with a bespoke bucket for that location, as it's just not practical to have adequate inventory of every single bucket available (there's a LOT of them and they're pricey little guys). I just replaced my intake cam and set my lash on .012 using a similar method described by Phil above. I had to take .004-.005 off of each bucket to get my clearance. I had access to a nice tool sunnen tool grinder that did the job quite nicely. I imagine it would've taken quite sometime to rub that amount of material off by hand. Has anyone even heard of anyone wiping an exhaust cam? Has anyone wiped a piper with spec lash? I have not had a Piper show any abnormal wear in any of my engines and have not heard of any customer having an issue with them. 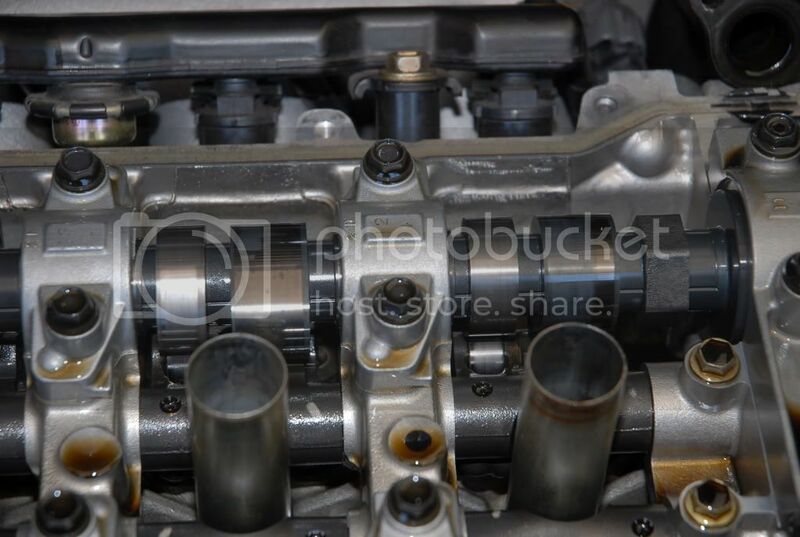 05 Elise: Wiped intake cam. Lobes 1,3,4. 20,400mi. Regular oil change intervals with easy daily driving. FWIW - we've had great results with the Piper Cams. No abnormal wear like the stock units. We lash them looser than OEM spec (just like we would w/ stock ones). The improved torque and power will vary depending on other specs of your engine, but we have seen 15 + Wheel Trq and 10 + Wheel Hp several times with SC and Turbo engines, with the only modification being the cams. We map the cam timing (VVT-i) with the EFI system to optomize the Piper profile difference. I am the third owner and it’s a dedicated track car at this point. Let me what you think as I would really appreciate some additional input. Thanks!